For their final nationwide new release of 2018 Modus Operandi hasn’t delivered a showstopper. At least not in a knockout punch / injury time field goal / fireworks at the end of a concert way. 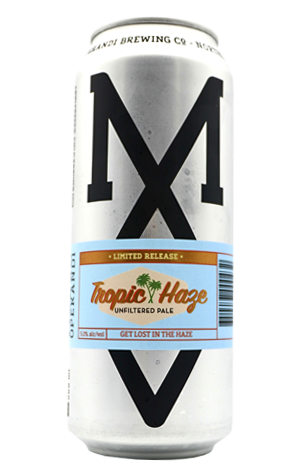 Tropical Haze is more a case of subtle envelopment, where you don’t necessarily know you’ve been got ’til they have you. And it’s part of a longer journey. The beer itself is a five percent ABV pale ale (remember those?) rather than the almost-anticipated big, hazy IPA. Yes, it’s still got a boatload of tropical fruit character – Galaxy and Citra hops tend to have that effect – and is still very, very hazy, but it’s just not got the full force to stop you in your tracks. Rather, it’s the kind of beer you finish and immediately want another one – quite canny, given the season. But the deeper story is perhaps the most understated part: yeast. Having bumbled into the brewery earlier this year and been presented with the chance to taste some side by side samples of Modus’ more approachable beers – one served as per normal and the other having been made with different yeasts – it became clearer what they’ve been playing at with all those hazy releases. They’d been experimenting. And the difference between some samples – the aggrandisement of fruity character and complexity – bordered on revelatory. Within the yeast seemed to lay the potential to notably ramp up and amplify somewhat simple beers, and that’s the background from which Tropic Haze has emerged. In essence, it’s a reminder that there’s no need to constantly blast people with the big guns when you can do a similar job by slowly turning the dial.